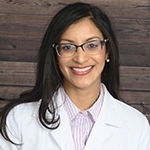 Dr. Veerula grew up in Fort Wayne, IN where she attended Canterbury High School before moving on to Ohio to pursue an accelerated BS/MD course. The diverse medical experience she has garnered over the past 6 years have made her an energetic, proactiveand compassionate medical practitioner, with her roots firmly planted in a holistic mind-body-spirit healing approach. Serving her client’s needs as a lifestyle, dermatologist and wellness consultant, Dr. Vindhya dons several hats and dons them all well. She believes in striking the right balance betweenboth utilizing evidence-based Western approaches that she learned in residency, while simultaneously drawing upon eastern techniques to help her patients recuperate better. This integrative and all-encompassing technique is the cornerstone of Dr. Veerula’s practice as a skincare specialist. She also advocates aplant-based lifestyle, and is always excited to share her knowledge and passionwith her patientsto enable them to be more involved in their own skin care, while empowering them to live more fulfilling, proactive lives. She stays grounded and energized through her personal wellness routine, whichincludes gulping down her wholesome smoothies and her daily dose of yoga and meditation practice. Dr. Veerula likes to spend time outdoors soaking in the sun, going hiking with her Aussie Shepard mix, Isosceles, as well as unwinding and going on trips with family and friends. She loves to inspire and be inspired on a daily basis, and looks forward to learning from and sharing with her patients and colleagues. She acquired her BS and MD degrees from Northeast Ohio Medical University (NEOMED), Rootstown, OH. She completed her Internal Medicine Residency in 2012. Dr. Veerula completed her Dermatology Residency at the Indiana University Medical Center in 2016.